Civilian jobs on military bases are available in every profession imaginable with over 180,000 civilians serving the United States in this capacity. There are a few things you should keep in mind when applying for civilian employment on military bases One of the first things you need to know is if you're eligible for hire. It can become very confusing when you try to understand the hiring process for civilian jobs in the military. Those who've been in the military, have a spouse or family member in the military, veterans, and other federal employees have precedence over anyone who has no affiliation with the military through service, marriage, family, or work. As you can imagine, the competition for these jobs is fierce. Whenever you read an open position announcement, you need to verify if the status of "Who May Apply" designates that the position is open to the public. This status designation means that you must be a United States citizen in order to be eligible for consideration for the position. If the designation is "Status Candidate", then you must meet the stated criteria for that designation. There are typically several qualifications that you must meet. There are three ways you can be hired for a federal position in the military: as a new hire, a transfer or as a reinstatement. New hire: This type of hire has never worked for the military as a civilian, but is possibly a federal employee, veteran, or spouse or child of a military member. Veteran: If you served in the military, then you may be eligible to apply for a civilian job. Disabled veteran: If you are a veteran with 30 percent or greater disability, then you may qualify for civilian positions. 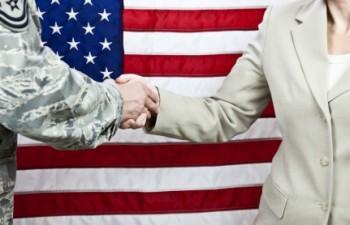 Military spouses: Spouses of military personnel are eligible to apply for federal employment. There are three groups of spouse eligibility: (1) spouse of service person who is being relocated, (2) spouses of service members retired with a 100 percent disability rating and (3) widows of service members killed in active duty that have not remarried. Family member eligibility: Unmarried children of military personnel stationed overseas who return to the US are often eligible for civilian military jobs. There are other conditions that apply such as the child must be younger than 23. There's also an overseas requirement of the applicant having served 52 weeks of an appropriated-fund position while overseas. Transfer: If you're a permanent federal civil service employee and also serve as a non-DOD (Department of Defense) employee, you may qualify for a transfer. Reinstatement: Reinstatements are another way a civilian may qualify for employment. If you're a former federal civil service career employee, then you have a lifetime reinstatement status. You can only be considered a career employee after having completed three years of continuous service. Whenever a position becomes available, managers are asked to review and select what are known as appointment authorities. A copy of the RPA (Request for Personnel Action), which gives the job title, duties, pay scale and other pertinent information about the job is sent to the listed appointment authorities. The appointment authorities are responsible for referring eligible candidates by creating a candidate pool from which the hiring manager selects candidates to interview. Check with the government agencies listed as appointment authorities for job listings and descriptions on the official civilian government job website. You must meet all of the qualifications stated in the listing before you can go on to the next step. Simply because you qualify for a job doesn't mean you'll automatically get the job. There will be other applicants and the hiring process will proceed just like others where you'll be interviewed. Before being considered, you will need to provide verification that you're eligible for the job. This will include various supporting documentation that is specified in the job application instructions. You'll also need to pass a drug screening before you can actually be offered a position. Often you will see such acronyms as CTAP (Career Transition Assistance Plan) and ICTAP (Interagency Career Transition Assistance Plan ) candidates as being eligible for various jobs. These are programs designed to help federal employees transition to other federal positions after job loss resulting from downsizing or other reasons. Air Force: The Air Force Civilian Service (AFCS) provides support to the United States Air Force with administrative, operations, and technical jobs that are filled by civilians. Army: The Army Civilian Corps (ACC) was established in 2006 to unify all army civilians. Civilians have worked in the Army for over 230 years and serve all over the world. Marines: To apply for civilian jobs in the Marines, you must access the Navy Human Resources website . You can read about civilian jobs with the Marines on the Marine website. Navy: You can access all civilian jobs at Sealift Command. There are many jobs available to civilians such as various engineering and other positions that are either afloat or shore side. To be eligible for a Navy civilian job, you must have a TWIC card (Transportation Worker's Identification Credential card), which is is a security clearance status. Coast Guard: Only those people with a TWIC can submit a USCG (United States Coast Guard) Merchant Mariner Credential application. Be prepared when applying for civilian jobs on military bases to provide various documentation, to complete forms and provide other paperwork associated with your former military or federal employment records.